Do not forget to ADD the area code prefix in front of the fax number. ie: 0362075400@send.flexifax.com.my for KL/Selangor or 072202123@send.flexifax.com.my for other states in Malaysia. FlexiFax is compatible with Email software/services such as Microsoft Outlook, Thunderbird, Eudora, Opera, Microsoft Outlook Express, Web based email clients, gMail, Yahoo Mail, Hotmail and much more. All email must be sent in Plain Text format only. Please ensure that the email address you are sending from is in the Authorise Email List. You can check and configure this by logging into the FlexiFax Control Panel. In a new email window, enter the fax number in the "T0..." field followed by @send.flexifax.com.my (you must include the area code of the destination fax machine for local faxes and add + follow by country code then area code for International fax). In the "Subject" field, enter the information you would like to name this fax as. Clear subject helps you to easily identify this fax when you need to. In the body of the email, type the text you would like to appear as your Fax Cover Page. It is good practice to indicate the total number of pages of the document here to ensure the recipient receive all of them. Attach the document that you want to fax. One attachment per fax transmission. If the entire message can be fitted in the Body of the email, there is no need to attach any document. Supported document formats are: DOC, TXT, TIF, PDF, or JPG. 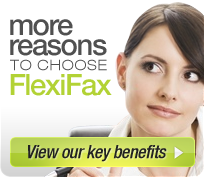 Click "Send" to send your email to FlexiFax. We will then convert your email and attachments to a fax document, deliver it to your recipient, and email you a detailed confirmation of your fax transmission.